This entry was posted on October 3, 2013 by Sports Traveler. He’s already a 4-time NFL MVP, Super Bowl winner, and future Hall of Famer. But Peyton Manning is having his best statistical season, so far, in 2013. The Broncos are undefeated at 4-0 and Manning has thrown 16 touchdowns, 0 interceptions, and has a passer rating of 138.0. Manning has completed an astounding 75% of his passes (117 of 156). For the 2-2 Cowboys, Tony Romo is also having an excellent statistical season, especially when it comes to completion percentage, a career-high 72.4% (110 of 152). 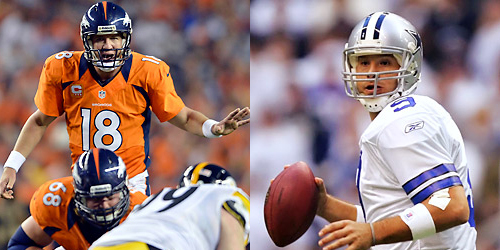 Comparing Romo to Manning in regard to completion percentage, you could say it’s a dead-heat. But there’s a big discrepancy if you look beyond that single stat line. The true comparison comes when you look at the ‘average yards per attempt’. Yes, Romo is completing over 72% of his passes, but the average yards-per-attempt is 6.7. Manning’s yards-per-attempt is 9.4. If you break it down even further to yards-per-completion, Manning’s number is even more impressive: 12.6. In other words, Manning is averaging nearly 13 yards every time he completes a pass. Romo is averaging 9.2. Basically, the stats show that Manning is throwing the ball down-the-field and Romo is throwing shorter passes. But that’s not the case. According to ESPN Stats & Information, Manning’s average pass has traveled only 7.9 yards past the line of scrimmage, ranking No. 21 among NFL starters. But here’s the main thing: Manning’s receivers have run for an NFL-high 723 yards-after-the-catch. That’s just over 180 yards per game in yards-after-catch. Manning’s longest pass of the season is 78 yards, a touchdown to Demaryius Thomas. Since Manning & Thomas teamed-up last season, Thomas has 21 receptions of 25-or-more yards. He’s obviously a big-play threat. Eric Decker, another starting wide receiver, averages even more yards per catch than Thomas (14.2). Even the “possession” receiver, Wes Welker in the slot, is in double-digits (10.3) in yards-per-catch with a long of 33 yards. The tight end, Julius Thomas, averages 13.2 yards per catch. What does all this mean? Well, Manning may throw vertically down the field on every pass attempt, but his receivers have done a great job of getting a premium on each completion because of the high number of yards after the catch. If you include the tight ends and running backs, the Broncos are averaging 6.5 yards-after-the-catch per completion. Bottom line: the Cowboys best chance of slowing the Broncos is, as linebacker Sean Lee said this week, to swarm the football. Limit the yards-after-catch. That’s where Manning and the Broncos are piling up the yards. Let’s talk Cowboys and Tony Romo. He has been very patient this season and has done a great job of protecting the football. I’m amused by the criticism this week that he hasn’t “taken enough shots down the field”. Romo can’t catch a break. He’s always been criticized for being too careless with the ball. Now he’s taking great care of the ball (only 1 interception, and that was on a busted route by a rookie receiver), and Romo’s still a whipping boy. Receiver Dez Bryant is the big play guy, but he’s been blanketed this year. He has the longest completion of the Cowboys’ season at 53 yards (it didn’t go for a touchdown). The next-longest completion? Only 24 yards to backup receiver Dwayne Harris. 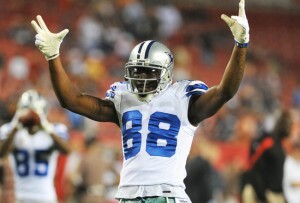 Dez averages 12.3 yards per catch, just over a yard less than Demaryius Thomas. Cowboys running back DeMarco Murray is tied with tight end Jason Witten for second on the team in pass receptions: each has 21 catches through 4 games. That’s a lot of Romo dumping off to Murray out of the backfield. Romo’s receivers have not piled up the yards after the catch. That’s why Romo has a high completion percentage, but averages only 6.7 yards per attempt. It’s among the lowest amount in Romo’s career. To keep pace with the Broncos, Romo’s receivers are going to have to get yards-after-catch against a physical secondary. The Cowboys running game has improved dramatically the past two games as the offensive line has improved its level of play, but the way the Broncos have put points on the board this year, is it realistic for the Cowboys to keep pace by running the ball? The Broncos are the league’s highest-scoring offense, on a staggering pace to be the NFL’s first 600-point team. The Broncos average 44.8 points this season. The Cowboys defense has allowed an average of 21.3 points per game. Something’s gotta give. I can’t wait for Sunday at AT&T Stadium in Arlington to see how the Cowboys decide to defend Manning. From the sideline, I’ll try to take time between plays to appreciate the setting, to realize that this is a great opportunity to see a great player, Peyton Manning, who is a true artist. I’m just glad I’m not having to chase one of his receivers! This blog post was written by Kristi Scales. Kristi is the sideline reporter for Dallas Cowboys Radio and the author of the CowboysSideline.com blog. Be sure to follow her weekly posts and listen to her reports from the sideline every Sunday!